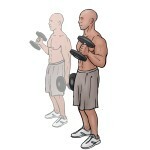 Stand holding dumbbells to the side with palms facing your torso. This is the starting position. Lift one dumbbell to shoulder height by bending at the elbow. Slowly bring the dumbbell back to the starting position and repeat with other arm.